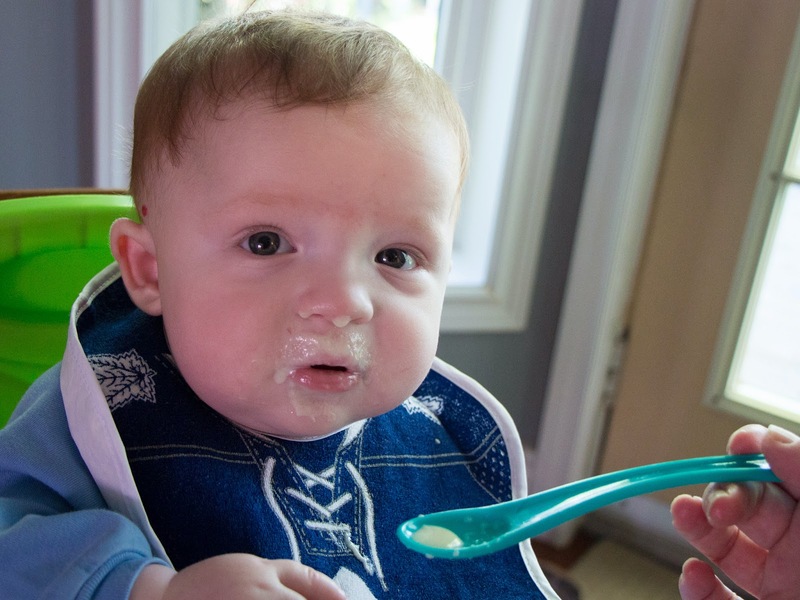 Gordon is six months old and now we can try feeding him with a spoon. First up: rice pablum mixed with some formula. Our first attempt was a complete success! 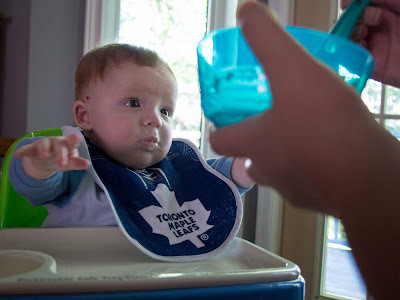 I had nothing to do with the Leafs bib, by the way. But hey, doesn't he look good in it? And check out that teal-coloured spoon! Today is Amanda's 35th birthday. What a year we've had, and there's such a challenging year ahead. Her blood results were solid enough to begin a seventh and final round of chemotherapy. Still, she's feeling ground down and crappy in every regard. Hard to enjoy your birthday when your bones feel like they're melting from the inside out and you hardly have the energy to lift a spoon to your baby's mouth. I love her and it hurts to see in such a state. Yesterday was also my parents' 42nd wedding anniversary. Well done! Amanda and I will mark our fourth anniversary in just over a week. Seems so long ago now. And our full house is even fuller now. Amanda's sister Amy is visiting from London, Ontario for a while. She's a smartass, so it's good to have the extra level of hilarity under our roof during these difficult times. I pray for your wife, and I pray the abuse of your son in the form of Leafs baby paraphernalia will end.